PRICE DROP!!! This well-kept had the same owners since 1973 and with just a little cosmetic updating - this home could be a showstopper and you could potentially add a huge amount of equity for a small amount of money. The roof, HVAC, garage door, water heater and other items were updated in the last 5 years! Another thing I love about this home, is the master and laundry area are on the main floor. You will love the charm of the enclosed porch area and separate outdoor stone patio with gas grill. And yet another thing I love is the the size of each room! And closet & storage space! Endless possibilities abound here at 508 Leicester Circle. The charming front porch courtyard leads you the foyer which has a vaulted ceiling to the 2nd floor where you will find two bedrooms and a full bath Have you always wanted a home in Hurstbourne? How about a home with the same owners since 1973- who have updated, maintained and cared for their home? Well, you're in luck- here it is! One thing I love about this home, is the master and laundry area are on the main floor. Another thing I love is the enclosed porch area and outdoor stone patio. And yet another thing I love is the the size of each room! And closet & storage space! Endless possibilities abound here at 508 Leicester Circle. The charming front porch courtyard leads you the foyer which has a vaulted ceiling to the 2nd floor where you will find two bedrooms and a full bath. From the foyer, you will see a large living room with beautiful windows and to the right and a formal Dining Room to the left and a den towards the back of the home. Just off the den is a door leading to a great entertaining space that is glassed-in for all weather entertaining! The kitchen is neat and clean and has a breakfast area and a "friends and family" entrance off the driveway. The 2 car garage entrance is off the breakfast area near the guest bath/powder room. The spacious master bedroom, en-suite master bath and walk in closet round out the main floor. The 2nd floor had 2 huge bedrooms with a full bath in between. Check out the closet space up here! The finished basement has one large area with a bar/game area as well as a separate room witch would be a great guest room or office. There's another room great for storage- it is unfinished in this spot - but, could easily be finished if desired. 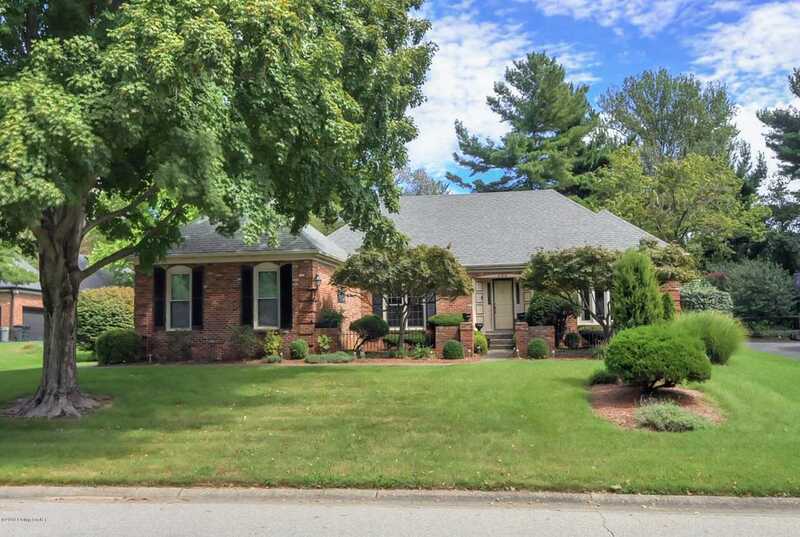 The city of Hurstbourne is one of the most sought after neighborhoods in this area and this home is just waiting for its new owner! Call for your private showing of 508 Leicester Cir. today!! Directions:South Hurstbourne Parkway to Seaton Springs Parkway to Leicester Circle. SchoolsClick map icons below to view information for schools near 508 Leicester Cir Louisville, KY 40222. MLS # 1519035: This property at 508 Leicester Cir, Louisville, KY 40222 is located in the Hurstbourne subdivision and is listed for $335,000. MLS # 1519035 has been on the market for 165 days.